Observation is a central notion to the field of Geographic Information Science. Monitoring phenomena (e.g. climate change, landslides, demographic movements) happening on the earth’s surface, and developing models and simulations for those phenomena rely on observations produced by technical sensors (e.g. a satellite) or humans. Resolution is an important aspect of observations underlying geographic information. The consequence of using observations at various resolutions is (potentially) different decisions, because the resolutions of the observations influence the patterns that can be detected during an analysis process. Despite the importance of the notion of resolution, and early attempts at its formalization, there is currently no theory of resolution of observations underlying geographic information. The goal and main contribution of this work is the provision of such a theory. The scope is limited to the characterization of the spatial and temporal resolution of single observations, and collections of observations. The use of ontology as formal specification technique helps to produce, not only useful theoretical insights about the resolution of observations, but also computational artifacts relevant to the Sensor Web. 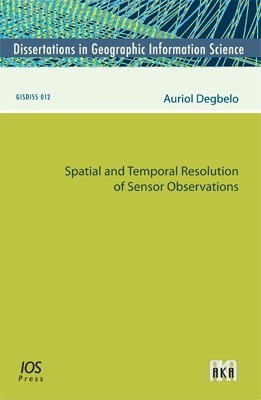 At a theoretical level, the work suggests a receptor-based theory of resolution for single observations, and a theory of resolution for observation collections, based on the observed study area and observed study period. The consistency of both theories is tested through the use of the functional language Haskell. The practical contribution of the work comes from the two ontology design patterns suggested and encoded using the Web Ontology Language. The use of the design patterns in conjunction with SPARQL helps to retrieve observations at different resolution. All in all, the work brings up ideas that are of interest to research on data quality in Geographic Information Science, and in the Sensor Web.